A broad, multidisciplinary area of study, communication focuses on the methods, tools, and platforms people use to interact with one another. The field incorporates language, history, fine arts, and social sciences (e.g., sociology, anthropology, and psychology), as well as technical disciplines like information technology and web media. Students who earn academic degrees in communication studies go on to pursue careers in business, education, law, technology, and media-related fields. At the bachelor's level, communication majors gain foundational knowledge in areas such as mass media, digital communication, and public relations. They also study the laws and ethics guiding today's media around the world. In addition to general communication studies, many colleges and universities offer specialized degree tracks in niche fields, such as business communication, visual communication, and broadcasting. Many of today's students choose to earn their bachelor's degree in communication online rather than in a physical classroom. Web-based communication degrees follow the same rigorous, comprehensive curricula as brick-and-mortar options. Also, because many online programs use an asynchronous schedule, this format may appeal to students with part-time jobs, childcare duties, and/or other commitments that might interfere with full-time, on-campus learning. Use this comprehensive guide to learn more about what to expect from an online bachelor's in communication program and the different career opportunities that await graduates. WILL AN ONLINE COMMUNICATION DEGREE PROVIDE ME WITH THE SKILLS I NEED TO ADVANCE MY CAREER? Due to the generalized nature of communication studies, an online bachelor's degree in this field prepares students for many different occupations. Those with a specific career path in mind can further boost their professional standing by earning a specialized degree or going on to pursue an online communication master's degree. Many online bachelor's in communication programs also feature required or optional internships, which allow students to receive supervised, hands-on training from experienced professionals at functioning worksites. WILL AN ONLINE BACHELOR'S IN COMMUNICATION PROGRAM WORK WITH MY SCHEDULE? An online communication degree track provides more flexibility than campus-based programs. Students can access course lectures and readings, submit written assignments, take exams, and communicate with professors on their own schedule from the comfort of their home computer. Current learning technologies also allow learners to study on the go using a laptop, tablet, smartphone, and other devices with Wi-Fi capabilities. For added convenience, online students can often carry out internships near their homes -- rather than commuting long distances -- to fulfill these requirements and earn an online media communication degree. WHAT JOBS CAN I GET WITH MY BACHELOR'S IN COMMUNICATION? An online bachelor's in communication serves as an entry point for students seeking a career in broadcasting, digital media, or media arts. Additionally, communication coursework emphasizes leadership, organization, and interpersonal skills. As a result, many communication majors go on to pursue careers in fields dedicated to working with others and creating harmonious workplace environments, such as human resources and office administration. Other popular career routes for communication degree recipients include journalism and writing, marketing and advertising, public relations, and graphic design. WHAT ARE THE BEST ONLINE COMMUNICATION DEGREES? Choosing a program remains a personal decision -- only you can properly evaluate whether a target school's strengths match your academic and/or career goals. 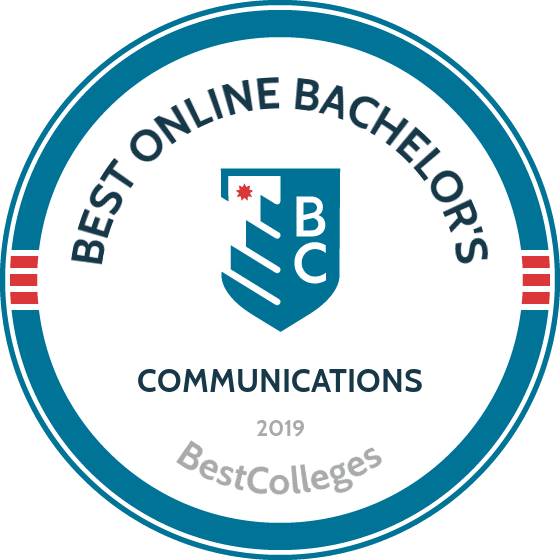 Use the following ranked list of schools as you begin your search for the country's best online bachelor's degree in communication programs. Additionally, if you decide to pursue an online bachelor's in communication, contact admissions specialists at your prospective colleges and universities to learn more about specific requirements and offerings. The University of Central Florida (UCF) sits in sunny Orlando, Florida. The school offers an online bachelor of arts in communication and conflict. The program requires 120 credits. UCF earns accreditation by the Southern Association of Colleges and Schools Commission on Colleges. During their studies, learners develop conflict resolution skills. Graduates pursue careers as arbitrators, counselors, dispute resolution administrators, public relations specialists, employee assistance providers, family law facilitators, foreclosure mediation coordinators, and human resources administrators. This degree also prepares students to attend law school. Courses include topics such as communication theories of interpersonal conflict, crisis communication, gender issues in communication, public relations, intercultural communication, and organizational communication. Students must also complete an internship in their local community. Individuals can complete the rest of the degree entirely online. Most students who meet the prerequisites can finish the degree in two years. UCF doesn't require applicants to take the Graduate Record Examinations (GRE). Freshman applicants must submit their official American College Testing (ACT) or Scholastic Aptitude Test (SAT) scores, official high school transcripts, and a $30 application fee. While not a requirement, UCF highly encourages students to submit a personal essay with their application. UCF students maintain an average 28.3 ACT score, average 1328 SAT score, and average 4.12 high school GPA. Freshman application deadlines include May 1 for fall, November 1 for spring, and March 1 for summer. Based in Miami, Florida International University offers an online bachelor of arts in communication arts with a track in organizational communication studies. This program includes 120 total credits. Out of these 120 credits, 60 remain communication-related courses. Students can complete the communication courses and general education courses simultaneously. Courses cover topics such as public speaking, business, and personal communication, intercultural communication, persuasion, communication theory, conflict management, civil discourse, and best interview practices. Learners choose five out of 12 classes to complete their degree. These 12 courses include artistic expression in global society, small group communication, crisis communication, social media's impact on communication, international business communication, managerial communication, communication on ethics, gender and communication, human communication, nonverbal communication, organizational change, and political communication. This broad program prepares students to work in nearly any communication-driven career. Graduates find jobs as public relations coordinators, consultants, and human resources specialists. This online communications degree also gives students the knowledge to work in marketing and sales, advertising, politics, and government. Learners complete the program entirely online, receiving their own personal success coach. To apply, individuals must complete an online application and submit a nonrefundable $30 application fee, SAT or ACT scores, and official high school or college transcripts. International students must also submit Test of English as a Foreign Language (TOEFL) scores or International English Language Testing System (IELTS) scores, and National Association of Credential Evaluation Services (NACE) evaluation. Florida International University only accepts students with a 2.0 GPA or higher. Colorado State University-Global Campus sits in Greenwood Village, but this school offers a bachelor of science in communication that students can complete from anywhere. Colorado State University-Global Campus receives regional accreditation from the Higher Learning Commission. Applicants must submit their official transcripts and ACT or SAT scores. All Colorado State University students must complete general education courses, including a class about navigating organizations and change, two English courses, science and math courses, and two academic electives. This university does not require a foreign language class. This program offers two communication-related specializations: strategic communication and marketing. Depending on their path, students take classes that either focus on selling products and services or informing the public about products or services. Courses include applying leadership principles, researching and writing for the communication professional, communication in the global information age, interpersonal communication, intercultural communication, mass communication and society, foundations of strategic communication, strategic communication, creating a diverse and ethical workforce, communication conflict and persuasion, and technical communication. All students must complete a capstone project in their final semester. An optional practicum component exists. This program aims to positively impact the diversity and culture of global communication practices by encouraging students to analyze ethical issues and legal environments. This broad program allows students to pursue many different career paths. Graduates can either extend their learning by attending graduate school or seeking internship opportunities. While studying at Northeastern University Global Network, students can take advantage of the school's bachelor of science in digital communication and media from anywhere. Since 1940, this university has maintained accreditation by the New England Association of Schools and Colleges Commission on Institutions of Higher Education. Northeastern University accepts individuals with at least a 2.0 GPA and requires all students to complete 120 credit hours before graduating. To graduate, students must complete both foundation and major courses. Foundation courses include English, math, philosophy, and information technology. Major courses include classes such as introduction to business, foundation in visual communication, web design and multimedia, consumer behavior, professional speaking, organizational communication, digital communication and organizations, writing to inform and persuade, technical promotional writing, web and mobile development, and database websites. In addition, students must complete a capstone course in their final semester. This communication program heavily emphasizes digital communication, so many course topics center around social media and website communication. During their studies, students design, implement, and manage a communication campaign for an actual client through the university's virtual public relations firm. Through this project, learners develop workplace skills and discover how to communicate with others remotely, making graduates ideal candidates for telecommuting jobs. Graduates find jobs as public relations coordinators, search engine optimization specialists, copywriters, web designers, video specialists, and marketing communication specialists. Based in New York, UB offers a bachelor of arts in communication. This hybrid program offers a combination of online and on-campus classes. The school receives accreditation from the Middle States Commission on Higher Education and the New York State Board of Regents. The university reviews applicants' ACT or SAT scores, cumulative GPA, and class rank when accepting applicants. Students may also submit an optional personal essay to strengthen their application. The school offers most foundation courses in a lecture format and covers most advanced courses through a seminar, discussion, recitation, or tutorial. These advanced class formats require students to actively engage in class discussions, read, write, and participate in problem-solving. Students in this program learn what drives human communication and how this applies to the current technological world. As a result, many classes focus on communication theories and research. Classes include principles of communication, introduction to the internet, principles and methods of interviewing, mass media and foreign policy, principles of persuasion, history of the media, communication theory, technical writing, journalism, health communication, nonverbal communication, public relations, promotional writing, and political communication. Students also must complete an internship and a capstone project. Graduates work in various settings, from nonprofits to large corporations. Some individuals pursue additional higher education by attending graduate or law school. East Carolina University in Greenville, South Carolina, provides students with a bachelor of science in communication. The school designed this distance learning program for students who must balance educational goals with a busy schedule. Learners balance family, work, and military careers while earning this degree. East Carolina University holds accreditation from the Commission on Colleges of the Southern Association of Colleges and Schools. State residents also benefit from a fixed tuition rate. This online communications degree requires students to take 42 foundation credits and six foreign language credits. Learners must also take 12 entry-level communication credit hours about topics such as media and writing, public speaking, and professional communication. Advanced classes cover topics such as public relations, journalism, media production, interpersonal communication, and organizational communication. All students complete a capstone project in their final semester. Individuals also choose a concentration, such as journalism or public relations, and take more courses that pertain to that topic. Internships remain unnecessary but highly encouraged. Students can complete their internship in their own community and take advantage of the university's internship resources. To receive acceptance into this online bachelor's degree in communications, incoming freshmen must boast a 3.0 unweighted high school GPA. Transfer students need at least a 2.5 college GPA. In addition, all students must maintain at least a "C" in all communication-related courses. In order to graduate, learners need 126 credit hours. Appalachian State University sits in Boone, North Carolina, and offers a hybrid bachelor of science in communication studies. In this flexible format, students experience learning remotely and in a traditional classroom setting, which prepares them for both office jobs and telecommuting jobs. Appalachian State University holds accreditation by the Commission on Colleges of the Southern Association of Colleges and Schools. When reviewing applications, the university examines an incoming freshman's high school GPA and ACT or SAT scores. For transfer students, the university expects a 2.5 minimum cumulative GPA in all previous college coursework. The university doesn't accept classes with lower than a "C" grade. Students can tailor the program to fit their interests. While learners complete certain core communication classes, they can take additional political communication or organizational communication classes. This degree is ideal for students who want to make a positive difference in the world or work in the service field. Program graduates earn jobs as consultants, environmental advocates, and healthcare management specialists. Courses include classes such as thinking through communication, public speaking in the disciplines, communication theory, rhetorical theory and criticism, gender communication, conflict management, and mass media and society. This program requires a minor. Some common minors that students pair with this degree include marketing, business, sociology, psychology, political science, and journalism. To graduate, learners must complete 122 credit hours, which might require electives. Appalachian State University suggests completing an internship to help fill the elective requirements. Students may complete up to 12 internship credit hours. Although the University of Minnesota-Twin Cities is located in Minneapolis, Minnesota, students can complete the school's bachelor of science in communication from anywhere in the world. This online program remains ideal for traditional students and working professionals alike. Students qualify for a refund if they drop the class early in the semester. This school holds accreditation from the Higher Learning Commission. Core communication classes cover topics such as public speaking, persuasion, and professional writing. Classwork prepares learners to communicate effectively in several different formats including speeches and the written word. Students must also complete an internship, but they may do so in their own communities. Students can tailor this program to their own interests and career goals. Graduates who choose a writing emphasis find jobs as editors, freelance writers, technical writers, and speech writers. The organizational communication/public relations emphasis remains ideal for students who wish to pursue careers in corporate communications, media relations, or public affairs and information. Students can choose a general emphasis in communication studies, which prepares them for careers in management, political campaigns, marketing, publications, sports information, and website design. Individuals who want to complete this online degree must own a computer and possess access to high-speed internet, a recent version of any web browser, and word processing software. The university provides students with access to an online learning portal. Some classes might require additional software. At Texas Tech University, students can complete their bachelor of arts in communication studies completely online, even though the campus sits in Lubbock, Texas. Each student gets paired with an academic adviser who offers advice and guidance. Currently, online tuition rates remain comparable to in-state tuition rates for on-campus classes. Online classes cost $226 per credit hour. However, Texas Tech provides financial aid on a case-by-case basis and accepts the Free Application for Federal Student Aid. This online program consists of 120 hours, and most full-time students complete this degree in just four years. Texas Tech evaluates each student's application on an individual basis, but students must submit an online application, their official high school transcripts, and ACT or SAT scores for consideration. The priority application deadlines for incoming freshmen include November 1 for spring, May 1 for summer, and December 1 for fall. Scholarship deadlines include November 15 for spring scholarships and December 1 for fall scholarships. Texas Tech designed the communication classes to help students develop both personal and professional communication skills. Course topics cover communication basics such as public speaking, persuasion, argumentation, interpersonal communication, organizational communication, and rhetoric. This program aims to stay current with today's communication landscape and the global economy shift. Most graduates don't stay at one job for their entire career, which is why this program prepares students to work in various careers. Graduates work as public relations professionals, human resource specialists, marketing directors, political activists, writers, editors, and speech writers. Regis University is located in Denver, Colorado, nestled between the Rocky Mountains. However, students don't need to live in Colorado to earn the university's online bachelor of arts in communication studies. This school maintains accreditation by the Higher Learning Commission, so students can maintain peace of mind in the university's integrity. To apply, individuals must submit SAT or ACT scores, official college transcripts, a $50 application fee, an online application form, an essay, and resume. The school accepts applicants on a sliding scale. Successful applicants typically boast a minimum 1140 SAT score or 20 ACT score, and a minimum 3.54 GPA. Regis University maintains a 60% acceptance rate. The fall application deadline remains August 1 for freshmen. In the 2017-18 academic school year, Regis University provided more than $134 million in federal, state, and institutional financial aid to eligible students. This program helps students develop soft skills that translate to any career. These include leadership, collaboration, critical thinking, persuasion, negotiation, and conflict resolution skills. Courses include interpersonal communication, intercultural communication, leadership principles, strategic leadership, and leading change and innovation. The program requires a capstone project, but not an internship, making it ideal for students who must work full time during their studies. While learners don't need to choose a minor, they only need 12 credit hours to earn one. Graduates typically work in leadership roles, but can also find jobs as public relations coordinators, marketing specialists, internal communication coordinators, and campaign managers. Regent University in Virginia Beach, Virginia, offers an online bachelor of arts in communication studies. Students complete this 120-credit program entirely online. However, students may also complete the degree at the Virginia Beach campus and benefit from the university's converged media lab and a multimillion-dollar equipped facility. This school holds accreditation by the Southern Association of Colleges and Schools Commission on Colleges. Online adult learners must submit a $50 application fee, unofficial transcripts, and an admission questionnaire. This online program remains ideal for adults ages 24 and older who work full-time jobs, but younger students may also take advantage of the convenient online format. The university offers several communication concentrations, including advertising and public relations, internet and social media, journalism, organizational communications, professional and technical writing, rhetoric and public culture, strategic communication, and theater. Classes vary depending on the concentration. However, all students must complete core classes such as New Testament, literature of the Western world, principles of journalism, college algebra, world geography, and U.S. history. The university encourages students to consider their future career when choosing a concentration. For example, graduates who wish to work as writers should pursue the principles of journalism concentration. Classes cover topics such as media relations, strategic communication, public speaking, speech writing, social media, content creation, website user experience, and nonverbal communication. For graduates who wish to continue their education, Regent University also offers a master of arts in communication with an emphasis in political communication. This path is ideal for individuals who wish to work closely with political campaigns or run for office. Founded in St. Louis, Missouri, in 1915 by the Sisters of Loretto, Webster University became one of the first Catholic colleges for women west of the Mississippi River. Today, Webster maintains its main campus in St. Louis and harbors locations in 60 North American cities, Europe, Asia, Africa, and online. Supporting Webster's academic roster of more than 100 traditional undergraduate and graduate degree options, the university offers over 50 online programs.Webster offers an online BA in communications encompassing 128 course credit hours that include required courses, electives, and Global Citizenship Program credits. Students must also complete 12 credits in a concentration of their choice within the communications department. Candidates may choose to pursue a senior thesis or professional media internship (practicum) to conclude the degree. Students must participate in and pass a portfolio review, typically during their junior year of study in the BA program. To qualify for the review, the student must satisfy a total of 24 credits through the School of Communications, including specific prerequisites in core subjects. Online courses (excluding the RN-to-BSN program) incur a set tuition rate per credit regardless of the student's place of residence. Students complete courses asynchronously through the WorldClassRoom portal. Online students may take courses in eight-, nine-, and 16-week formats and may begin the program during the fall, spring, or summer. New students must consult with their academic adviser before enrolling in their first online course at Webster. In addition to online advising, Webster offers resources including disability services and tech support. Webster University receives accreditation from the Higher Learning Commission. Founded in Grand Forks in 1883, six years before the founding of North Dakota, University of North Dakota graduated an inaugural class of six students. Today, the university serves a student enrollment of nearly 14,000 and offers more than 225 academic programs, 120 of which are available online. UND's sprawling 550-acre campus remains the largest of its kind in the state. Here, students enjoy 13% lower tuition than comparable schools within the surrounding 11-state economic region.UND's online bachelor's degree in communications emphasizes comprehensive career skills for broad applications in the media workplace. The BA in communications encompasses 120 hours in major coursework and 21 additional credits in minor requisites. Students may choose from course topics including popular culture, web and mobile publishing, and digital video production. Concentration options include strategic communication, digital journalism, advertising, PR, social media strategy, and digital analytics. Students must complete some measure of experiential coursework to earn their degrees. Most students complete an internship to fulfill this requirement, such as at a local broadcast company, news agency, or advertising firm. Additionally, UND emphasizes intercultural coursework and offers optional study-abroad experiences and a concentration in international communication.Students can register for the online BA in communications during the fall, spring, or summer semester. Most students complete the degree online within four years. Online students enjoy a wealth of support services including online tutoring and advising, a writing center, 24/7 tech support, and career and disability services. Established by the Rev. Jerry Falwell in 1971, Liberty University expanded into one of the nation's leading evangelical liberal arts institutions. Today, the university serves more than 100,000 students at its Lynchburg campus and online. Liberty began implementing distance programming in 1985 and now offers over 250 of its 550 academic programs online. Liberty's online communications degree emphasizes a combination of hands-on experience and career skills in the latest technology in the communications field. The BS in strategic communication offers specializations in social media management and strategic communication. The program requires completion of general education/core competencies, major core coursework, and electives, including an internship course. Students must also complete an agency/field project to close the degree. In either concentration, students must complete general education/core courses consisting of prerequisites in information literacy, communication, math, science, technology, critical thinking, and Christian life and thought. While the majority of major core coursework remains the same for either concentration, students in the social media management cognate focus on social media writing and development, while strategic communications students hone skills in public relations and best practices in employee and organizational communications.Liberty recommends a fall start for the online BS in strategic communications. Students complete coursework online through the Blackboard platform and enjoy online test proctoring, a writing center, and a comprehensive digital library database. Online students may attend commencement exercises at the Lynchburg campus with their Liberty peers. The Southern Association of Colleges and Schools Commission on Colleges accredits Liberty University. With five physical locations and an online campus, Arizona State University offers hundreds of undergraduate and graduate degrees and certificate programs. The university boasts one of the top online bachelor's programs in the nation, according to U.S. News & World Report and the Princeton Review. ASU serves a student enrollment of roughly 20,000 through programs in more than 350 undergraduate and 450 graduate majors. Students can choose from over 1,705 available online programs. The online bachelor of science in communications at ASU encompasses 120 course credit hours and offers a fast-track option. Full-time students and those with prior transferable credits may qualify to complete the degree in 2.5-3 years. The program combines prerequisites, core, and upper-level major coursework that emphasizes practical skills for the contemporary global communications workplace. Topics explore business and professional communication styles, intercultural communication, and leadership, persuasion, and social influence. All students must satisfy prerequisites in English, math, science, foreign language, and the arts to pursue a bachelor's degree at ASU. Freshman applying to the BS in communications must graduate in the top 25% of their high school class with a minimum 3.0 GPA in the competency courses listed above. Additionally, students must submit SAT or ACT scores. Students who do not meet minimum requirements may still qualify for conditional enrollment through the earned admission track.ASU students enrolled in online programs pay a set tuition rate regardless of their state of residence. The university recently migrated its online course delivery content from Blackboard to Canvas, but it has maintained its many resources for distance students, including access to success coaches, student advising, and tech support. ASU features dedicated orientation instructors to help introduce new students to the online learning experience. Established on El Toro Marine Corps Air Station in Orange, California, in 1861, Brandman University transitioned from providing education programs to military students to educating students around the world. The university now encompasses 25 locations throughout California and Washington and maintains a comprehensive online campus. Brandman serves an enrollment of more than 10,000 students in over 80 academic programs. Brandman's BA in communications and media encompasses an interdisciplinary curriculum in professional communications and PR strategies. The program comprises 120 semester units and combines core courses, communications and media elective classes, and minor coursework. Students must satisfy prerequisites in basic skills and liberal education foundations to complete the degree. Core topics include multimedia journalism, persuasion methods and techniques, and principles of public relations. Students may choose to complete an independent study or experiential learning project offered as optional elective courses. Applicants must complete a minimum of 12 transferable baccalaureate (or equivalent) courses from a regionally accredited institution with at least a 2.0 GPA. Active military students may qualify to transfer credits from the Community College of the Air Force or other military/educational institutions recognized by Brandman.Brandman students enrolled in the online bachelor's degree in communications may take fully online or hybrid courses, and online students can start the program during one of several entry points throughout the year. Brandman delivers online courses through Blackboard and offers resources for students such as an online writing and math center, live technology training, and multimedia writing and design support. Brandman University holds accreditation from WASC Senior College and University Commission. The University of Arizona Online ranks among the top 30 online bachelor's programs in the nation, according to U.S. News & World Report. The university offers unique degree completion opportunities for former UA students through its Second Start program. Offered through the College of Social and Behavioral Sciences, the online BA in communications at UA Online emphasizes the communication skills needed in a PR or journalism career. Coursework focused on nonverbal, relational, and emotional communication methods and strategies explores how such interactions affect human relationships. The online communications degree encompasses 120 credits in a combination of core, skills, elective, and theory coursework. In addition, students must complete general education prerequisites in composition, math, foreign language, humanities, and social sciences courses. Graduates with a qualifying associate degree from an Arizona university may potentially transfer credits toward a bachelor's degree at UA Online through the AZ Transfer Pathways program. UA Online offers an online orientation course specifically for distance students. Applicants returning to complete their degree at UA Online should possess at least 12 transfer units with a minimum 2.5 GPA for admissions consideration. Distance students pay the same per-credit tuition rate regardless of their state of residence. UA Online offers students numerous resources including a dedicated enrollment team and personal academic success specialist. Additionally, students enrolled in online programs enjoy benefits including software discounts and free access to the full Adobe Creative Cloud.New courses begin every 7.5 weeks. The University of Arizona Online holds accreditation from the Higher Learning Commission. Established in Pullman as a research university in 1890, Washington State University today boasts additional campuses in Spokane, Tri-Cities, Everett, and Vancouver. To house its comprehensive distance learning division, WSU founded the Global Campus in 2012. Out of a total student enrollment of nearly 31,500, more than 3,000 WSU students enroll in online courses through the Global Campus.WSU's BA in integrated strategic communication encompasses a broad foundation in traditional and digital media, including PR principles and advertising strategies. The 120-credit online communications degree comprises core and upper-division communications courses in topics such as creative media strategies and techniques, consumer insights and branding, and communication campaigns and management. Students must complete an internship to conclude course requirements. Prospective students must satisfy certification requirements in communication, media, and public speaking coursework -- and pass a grammar and writing exam. Transfer applicants must complete a minimum of 15 credits of the BA at WSU. Students pay various tuition rates per credit for undergraduate courses during the fall and spring semesters -- depending on the student's state of residence and whether they enroll in full- or part-time coursework. Students taking summer courses through the Global Campus pay the same rate regardless of their state of residence or courseload; WSU maintains a two-credit minimum charge per each semester. Online students enrolled at least half time may pursue financial aid. WSU delivers most coursework asynchronously through the Blackboard platform, and online students receive support through academic advisers, student government, and highly interactive social media accounts maintained by the Global Campus staff. Additionally, students can access the WSU library and bookstore, tech support, and disability services as needed. The Northwest Commission on Colleges and Universities accredits WSU. Founded in 1898, Dallas Baptist University provides service-based programs at the intersection of faith and learning. The university serves more than 4,700 students at its Dallas/Fort Worth campus, two off-site learning centers, and online. Students can choose from more than 100 undergraduate and graduate programs, all from a Christ-centered perspective. DBU claims the distinction as Dallas's first two-year higher learning institution.DBU's bachelor of arts and sciences in communication spans a broad curriculum of professional and core major coursework. The 120-credit online communications degree combines general studies, communication major, and elective courses. Courses explore topics such as communication styles, social media, and speech and interpersonal communication. Transfer students must complete the last 30 credits of the online BA and a minimum of 12 credits in the communications major at DBU. The bachelor of arts and sciences in communication at DBU requires several field-based, service-learning components. Students must complete a professional studies course in lifelong learning and major coursework such as field experiences in desktop publishing and design. Students may enroll in courses online during the fall, spring, winter, or summer semester. Fall and spring courses span 16 weeks, winter courses last for four or eight weeks, and online summer courses last for 10 weeks. DBU students complete online coursework through Blackboard, and online students enjoy 24/7 tech support, a writing center, library, and disability services. Though rates vary slightly by semester, students pay the same per-credit tuition for undergraduate online coursework regardless of their state of residence. DBU offers scholarship options for online students enrolled in programs including the BA in communications degree. Dallas Baptist University holds accreditation from the Southern Association of Colleges and Schools Commission on Colleges. With 1,500 students at an average age of 34, University College at the University of Denver remains the largest entity providing continuing and professional studies at DU. University College offers career-focused graduate degrees, certificates, and bachelor's completion programs in business, management and leadership, IT, and communications disciplines. University College joins nine other schools in academic subjects, including law and business, comprising DU.The online communications degree at DU's University College spans 21 common core, major, and elective course requirements. Common core courses explore general education topics including ethical decision-making, organizational behavior, and leadership. Major coursework emphasizes skills in civic engagement, media and society, and cross-cultural communication, culminating in an integrative project design course and the production of an integrative project. DU does not require applicants to submit standardized tests such as the SAT or ACT for admissions consideration. Students applying to the BA in communication arts should complete at least 27 semester hours (40 quarter hours) of transferable credits earned at a regionally accredited university and possess a minimum of three years of work experience. Additionally, applicants must submit a personal statement to demonstrate writing skills and, if accepted, a serious commitment to the academic program at DU. University College students complete online coursework asynchronously in the Canvas learning management system. Distance students follow a quarter-semester schedule and may apply to begin courses during the fall, winter, spring, or summer. Online students pay a flat rate per credit for courses in the bachelor's completion program regardless of their state of residence. DU offers both need-based and merit scholarships to qualifying online students. DU holds accreditation from the Higher Learning Commission. Founded as a training facility for teachers in the southwest region of Missouri, Missouri State University established its main campus in Springfield in 1905. The university eventually expanded to include locations in West Plains and Mountain Grove, Missouri, along with off-site learning centers in Dalian, China, and online. MSU today serves more than 26,000 students and offers more than 50 online undergraduate and graduate programs.The online bachelor's degree in communications at MSU emphasizes a customizable curriculum, enabling students to choose their own minor area of study online. The 120-credit program encompasses a broad foundation in general education courses, combined with the student's choice of electives in a concentration such as public relations, organizational communication, or health communication. To earn the online communications degree at MSU, students must complete a program assessment and a capstone experience in public affairs during the final semester. Applicants to the bachelor's completion program at MSU must complete at least 59 credit hours and general education prerequisites for admissions consideration. Additionally, students must possess a combined GPA of at least 2.5 or a minimum 2.75 GPA for the last 30 credits of transferable courses. Students admitted to the program must complete prerequisites in communication theory, mass media and society, and fundamentals of public speaking with a GPA of at least 2.5. MSU students complete courses online in Blackboard. Distance students enjoy support services including extensive career counseling and advising, one-on-one tutoring options in the virtual classroom, and an online writing lab. Online students pay tuition per credit depending on the course type and whether the student claims Missouri residence. West Virginia University's flagship campus, established in 1867 in Morgantown, remains at its original location. The university eventually expanded to include campuses in Beckley, Keyser, Charleston, and Martinsburg, as well as an online division. Today, West Virginia University serves a student enrollment of nearly 30,000, offering more than 360 majors across 14 academic colleges and schools. WVU receives prestigious R1 Carnegie classification and harbors dozens of Rhodes, Truman, and Goldwater scholars.Designed for broad applications in any career field, the online communications degree at WVU provides a foundation in professional communication skills. The BA with an emphasis in communication studies requires major coursework in communication organizations and institutions, nonverbal and intercultural communication, and persuasion. Additionally, students may choose from electives including business and professional communication, American diversity in film, and computer mediated communication. Core and general education coursework comprises the additional component of the BA degree. Designed as a degree completion program, the WVU Regents BA suits applicants with at least 20 transferable college credits and a minimum 2.0 GPA. Students with fewer than 20 prior credits must submit high school transcripts for admissions consideration. Distance students may apply during the fall, spring, or summer term. WVU students complete courses online through Blackboard and enjoy access to unique support resources, including child and family care for distance students and tools to encourage the wellbeing of online students through the WELLWVU portal. Online students pay variable tuition per credit depending on whether they reside in or out of West Virginia. West Virginia University holds accreditation from the Higher Learning Commission. California Baptist University offers online and hybrid programs in more than 40 majors and concentrations. CBU Online, the university's division of online and professional studies, ranks among U.S. News & World Report's best online bachelor's degrees and best online veterans bachelor's programs. CBU Online programs encompass the same Christ-centered principles and values as when the school opened 60 years ago.The BA in communication studies at CBU emphasizes communication strategies and public relations-related professional skills. Intended as a degree completion program, the online communications degree requires completion of 48 major course credits in communication studies in addition to general education courses and prerequisites. Students explore topics including media and society, interpersonal communication, and public relations. All students at CBU complete coursework in overview of the Bible and foundations of Christian thought. Applicants must complete 24 transferable college credits toward the bachelor's degree or submit a high school diploma (or equivalent) for consideration. Qualified students also possess a minimum 2.0 GPA. CBU assigns all prospective students an academic adviser to guide them through the process of registration, applying for financial aid, and developing an appropriate degree completion plan. Distance students remain with their personal advisers for the duration of their program at CBU. CBU students pay the same tuition rate per credit for all online coursework in the BA degree regardless of the student's state of residence. The BA in communication studies allows students to enroll full- or part-time, but distance students typically complete the online communications degree in an average of 16 months. Courses are completed in Blackboard. California Baptist University maintains accreditation from the Western Association of Schools and Colleges Senior College and University Commission. Founded in 1847 as the Kentucky Female Orphan School, Midway University now enrolls more than 1,600 male and female students at its campus in the heart of Kentucky's horse country. Midway offers associate, bachelor's, and master's degrees in arts and sciences; business, equine, and sport studies; and health sciences -- not to mention more than 20 degrees and certificate programs online. Midway's online BS in marketing communications emphasizes the strategic use of marketing tools and advanced communication skills for the global marketplace. Students may choose from a concentration in either writing or graphic design. The 120-credit program combines general education, concentration, and elective courses. Topics include advertising and marketing principles, consumer/audience analysis, and global brand management. Distance students must complete a capstone to conclude course requirements. Applicants with at least 24 transferable credits from a regionally accredited institution must submit official college transcripts and demonstrate a minimum 2.0 GPA. Those with fewer than 24 transferable college credits must submit high school transcripts and SAT/ACT scores for admissions consideration. Midway students earning the online communications degree pay tuition based on the number of credits taken each term. Midway students complete courses online through the Moodle platform. Distance students can access a variety of online support resources including virtual tutoring, career services, and tech support. Online courses last for eight weeks, and students may enroll in online programs during multiple start dates throughout the year. Midway University maintains accreditation from the Southern Association of Colleges and Schools Commission on Colleges. Mississippi College (MC), located in Clinton near Mt. Salus, is the oldest university in Mississippi. Originally founded in 1826, it has been co-ed since 1827, and today it is a private, Christian liberal arts college affiliated with the Mississippi Baptist Convention. MC serves 5,000 students annually and offers 80 undergraduate and 50 graduate programs. Among these are its online BA and BS in communication degrees. MC's communication department offers both a bachelor of art and a bachelor of science, and concentration options include interpersonal and public communication, journalism, mass media, political communication, public relations, and sports media, plus a minor option for theater. This wide array of specializations means MC's online communication program adapts to students' interests, helping them pursue careers in industries like film and television, politics, marketing, public relations, professional and collegiate sports, and ministry. Coursework in the bachelor's degree in communication program includes public speaking, public relations, communication law, negotiation, interpretive reading, and introduction to graphics software. General education requirements at MC also include six credits of Bible studies, with one course on the New Testament and one course on the Old Testament. In addition to classwork, on-campus communication students at MC can gain practical experience by working with the weekly campus news program MCTV, the campus newspaper The Collegian, or with the MC Choctaws Sports Media Team. Eshe Glover has spent the past 18+ years honing her communications prowess and definitely knows her way around high-level strategy, right down to the nitty-gritty details of execution. Eshe's people-centric approach is the foundation for BluePepper Public Relations' success and the reason her work has been recognized by the Public Relations Society of America, City County Communications and Marketing Association (3CMA), the International Association of Business Communicators, and the American Public Transportation Association. Eshe is a graduate of Northwestern University and Leadership Charlotte. Why did you choose to earn a bachelor's degree in communication? Was this a field that always interested you? I originally pursued a degree in journalism; however, after interning, I realized I enjoyed writing and telling stories, but did not want to work in media. (I now know a journalism degree does not restrict me to working in media.) After speaking with my advisor and researching the field of communications, I decided to switch my major. What are some of the most crucial skills you gained in your bachelor's degree program that apply to your job on a day-to-day basis? One of the most crucial skills I gained was proficiency in various writing styles. I also learned effective conversation skills and how to ask questions that encourage people to open up and share. And I learned to listen. The last skill was not learned as an official part of the degree program, but was the result of amazing professors who emphasized learning and developing soft skills in addition to the core curriculum. What was the job search like after completing your bachelor's degree? Did you feel fully prepared to transition from school to the workplace? I found the job search after college to be daunting. I felt prepared to transition from school to the workplace because I had the benefit of various internships; however, "communications" is so broadly defined that it was difficult for me to identify a position that fit what I envisioned. Please explain more about why you opened your own firm. I began my career in corporate America and, although I enjoyed the experience, it never felt quite right. I also worked in the public and nonprofit sectors; however, as the director of communications for my organization, there was little room for advancement. As I contemplated my next move, I realized I wanted to work with and assist various nonprofits. This desire led me to begin consulting, which then evolved into opening my own firm — BluePepper Public Relations. Among all of your different types of experience within the field of communications (corporate, nonprofit, government, civic), which did you prefer the most, and why? Hands down, I prefer working in the nonprofit sector. Generally, there are fewer resources, which really pushes me to be creative and find new ways to help them connect with their communities. One of the biggest challenges is staying up-to-date on the various communications tools and trends, and identifying the most effective ones to help us reach our goals. It is common for a client to suggest they should have a presence on "x platform" or to try "x" without fully understanding how it works, what it requires, and whether it will help them better connect with their communities. Another challenge is getting clients to understand they do not have to respond to every comment in real time. We live in a 24-hour news cycle, and customers communicate around the clock. It's not feasible (or advisable) to always be available and responsive. How do you think the field of communications will change in the coming years? I predict the use of artificial intelligence (AI) will change the communications field in the coming years. Understanding which tasks can be effectively and accurately tasked to machine learning will be critical in helping us work efficiently. For example, using AI to objectively track, monitor, and analyze coverage and mentions will provide a more accurate (and faster) summary of coverage and conversations. This will help us determine if adjustments in the communications strategy are required. From a brand strategy standpoint, AI will be helpful with identifying and qualifying influencers based on data and metrics. The increased use of AI also makes it critical for us to incorporate "smart assistant-friendly" tactics, such as ensuring URLs, hashtags, handles, etc. have high voice recognition. In the future, image/facial recognition will provide instant feedback on an audience's sentiment during crisis situations, product releases, corporate announcements, speeches, etc. This instant feedback will alert us as to whether our messaging (and messenger) is resonating, falling flat, or offending. What advice would you give to students who are considering a bachelor's degree in communication? Do your research to understand the career prospects. Build and cultivate your network; relationships are critical. Work in the field or shadow someone in the field early in your collegiate journey; working in communications is different from studying communications. Accept that you will make mistakes; they are learning experiences. And do not accept the unrealistic expectation that you are supposed to be an "expert" in the field. Oh yeah — pick a side on the Oxford comma debate. When searching for an online communication degree, review the department's overarching direction to ascertain whether coursework and available concentrations align with your goals. The concentrations highlighted in this section provide a general sense of what's available; however, students should check with individual programs to learn more about specifics. Designed for individuals who want to work in news media, this concentration builds skills in research, writing, interviewing, and analyzing. It also teaches learners about the evolving state of the industry and how to use emerging media platforms to convey news. This concentration teaches students to convey organizational and client goals through effective communication. Learners also gain knowledge related to media relations, publications, and event planning. Designed for individuals interested in communicating critical information about health and healthcare, this concentration teaches learners to use correct terminology, share advanced concepts effectively, work with partners and governmental agencies, and tailor messages for diverse audiences. In addition to looking up available concentrations, students should review the courses offered at a given institution. The list below describes a few sample courses commonly offered by online bachelor's in communication programs. This class helps individuals interested in an advertising career gain the skills needed to communicate effectively through visual aids. Examples include using photography and video to effectively gain clients, explain ideas, and disseminate information. Frequently taken in the first two years, this class teaches students about historical and contemporary approaches to communication. It also examines some of the subject's more recognized methodologies. This course helps all communication students -- no matter their intended career -- build a solid foundation for future learning. This class covers topics such as free speech, ownership and copyright, public records, information access, and libel. Students learn how to use words and images appropriately, as well as how laws and movements challenge the dissemination of information. Unlike writing for news media, public relations, or advertising, technical and business communication typically use a different style guide and format. This course reviews topics such as corporate communication, branding, internal communication, creating technical process manuals, and developing appropriate signage. In this upper-level course, students create a comprehensive and cohesive communication strategy. Learners consider factors such as long-term and short-term goals, legal and ethical implications, digital media strategy, and company branding to design a mock strategy. Earning an online mass communication degree provides graduates with numerous concrete skills that transfer to many different roles and industries. While each student gains different competencies, degree seekers can anticipate acquiring some of the following talents. Public Speaking: Graduates learn how to effectively and efficiently convey information in the form of speaking. This valuable skill helps those who hope to work in public relations or in news media as a spokesperson. Research: Because information remains crucial to communication, students learn how to conduct online and print research to help strengthen their arguments and demonstrate the validity of their statements. Writing: Through a variety of technical and creative writing courses, students hone their ability to communicate effectively through the written word in forms such as news articles, social media posts, and academic papers. Editing: Even the best writers must edit their work. Communication students learn how to edit their writing to fit an audience's needs and ensure that their writing meets requirements related to length, tone, and publication type. Media Relations: Whether working in public relations, advertising, or marketing, communication professionals often maintain close connections with the media. Communication programs help prepare graduates for these interactions by going over media requests, press conferences, and interviews. How Long Does It Take to Get an Online Bachelor's in Communication? When pursuing a online bachelor's degree in communication, most students spend about four years and complete approximately 120 required credits. However, some variability does exist. For example, some learners enroll on a part-time basis due to personal or professional obligations. These students can expect to spend about six years in school. Conversely, other degree seekers decide to pursue an accelerated program, which makes it possible to graduate in just three years. Other factors to consider include whether a program is individually paced or uses a cohort learning format. While students following the former pathway can move at their own pace, cohort participants must complete coursework in lockstep with a group of their peers. Attending a properly accredited school is incredibly important. Two broad types of accreditation exist: institutional and programmatic. Institutional accreditation applies to an entire college or university and comes in the form of regional or national accreditation. The regional form tends to be considered more rigorous and prestigious. When reviewing online communication degree options, degree seekers can also look for programs accredited by the Accrediting Council on Education in Journalism and Mass Communications; the council's website provides a database of accredited schools. In addition to institutional and programmatic accrediting agencies, learners should familiarize themselves with the Department of Education (ED) and the Council for Higher Education Accreditation (CHEA). These do not accredit institutions directly, but oversee accrediting bodies to ensure that each sets and maintains acceptable standards and practices. CHEA operates as a member organization for more than 3,000 accredited institutions and 60 accrediting agencies, championing the accreditation process and monitoring standards. Students can use the ED's Database of Accredited Postsecondary Institutions and Programs to find a suitable college or university. According to the National Center for Education Statistics (NCES), the outlook for communication majors remains on par with the average outlook for all occupations. A recent NCES survey found that communication bachelor's degree recipients ages 25-29 hold an unemployment rate of 4.8% -- the same rate for people in this age bracket with degrees in all fields of study. Using data from this survey, the following table compares unemployment numbers for communication majors and students with degrees in related academic fields. As the table shows, the unemployment rate for communication majors is lower than degree holders in many other areas. In some cases, the unemployment rate stands more than a full percentage point lower. The unemployment rate for communication degree holders is also lower than national average for employees in all industries (i.e., 5.0%). According to the 2018-19 PayScale College Salary Report, students who earn a bachelor's degree in communication stand to earn a median annual salary of $44,300 during their first five years on the job; this number increases to $77,500 for workers with at least 10 years of experience. However, salaries for communication students also vary based on their major specialization. Using PayScale data, the table below depicts communication-related fields in terms of the median salaries at the entry-level and mid-career marks. According to the table, college graduates with degrees in these 12 communication-related majors earned average annual salaries of $43,833 at the entry-level mark and $78,508 at the mid-career mark. Students should also note that salaries in communication fields depend on the specific job title. The next table features career growth and salary expectations for five of the communication industry's most common career paths. Of these five positions, writers experience the highest rate of salary growth during their careers; the median earnings for this profession increase by 56% between the entry-level and late-career marks. Communication specialists placed second with a 46% increase in earnings. The remaining three careers saw their salaries grow by 25-42% after 20 years on the job. Advertising, Promotions and Marketing Managers: These professionals oversee marketing campaigns, promotional events, and other programs designed to boost public interest in a specific product, company, individual, or event. Managers often work closely with their clients to ensure that a campaign depicts the subject in a flattering, accurate light and remains accessible to a wide audience. Public Relations Specialists: Public relations (or PR) specialists generate and maintain a positive image for their clients, which often include companies, organizations, or notable individuals. These workers produce literature (e.g., press releases) to promote their clients and handle bookings for conferences, speaking engagements, and other events. Interpreters and Translators: These individuals specialize in converting spoken or written information from one language to another. Most of these professionals specialize in one or more specific languages. As more people immigrate to the U.S., the industry growth projections for interpreters and translators remain quite high. Human Resources Specialists: Human resources (or HR) specialists manage the recruiting, screening, interviewing, and hiring of new company employees. They may also design and develop orientation programs for incoming workers and mediate disputes between employees. Making professional connections and learning about different approaches to communication is crucial for a successful career. Professional organizations offer a great entry point for students and recent graduates hoping to learn more about their chosen careers. The following list details three of the country's most prominent organizations that support communication professionals. These organizations host networking events, provide online trainings, maintain active job boards, and offer other services for career-ready college graduates. Public Relations Society of America: Founded in 1947, PRSA stands as the world's largest PR-related professional organization, consisting of more than 22,000 members in the PR and media communication industries. A comprehensive professional development tool on the organization's website allows users to browse courses and training sessions by category and location. National Human Resources Association: Founded in 1951, NHRA assists aspiring HR employees by hosting networking events, job training, and continuing education. Individual, corporate, and student memberships exist. American Marketing Association: Founded in 1953 by business pioneer Neil Borden, AMA provides advocacy and professional development for members of the marketing industry. The association's website boasts a compendium of information with extensive resources related to branding, engagement, and consumer metrics. Despite the relative affordability of online programs, most students still need financial assistance. Students should complete the Free Application for Federal Student Aid (FAFSA) form to learn more about loans, grants, and other opportunities offered through the U.S. government. Additionally, students can pursue private grants and scholarships made available through nonprofits, companies, and other sources. Check out our collection of resources below to learn more about financial aid options. Approximately two-thirds of today's college students rely on loans to fund their education, but many financing options remain overlooked. Completing the FAFSA is a crucial first step for any student with financial need. Our FAFSA guide features a step-by-step rundown on the process and answers to several frequently asked questions. Financial aid for online learning is equivalent to financial aid for campus-based learning, but this hasn't always been the case. Learn about the changes and different funding opportunities available to online students. Online programs can provide an affordable and flexible option for women trying to balance the demands of work, family, and earning a degree. Browse our list of scholarships that specifically target women. Online college programs represent flexible and affordable options for single parents interested in earning a degree and securing their family's financial future. Review our list of scholarships, grants, and other financial aid options geared toward single moms and dads.